Use the form below to inquire about Farmhouse Homestay at Hatnoli . Use the form below to reserve for Farmhouse Homestay at Hatnoli . Basant Rani is the latest room of the outhouse area. It has a double bed and an attached bathroom. 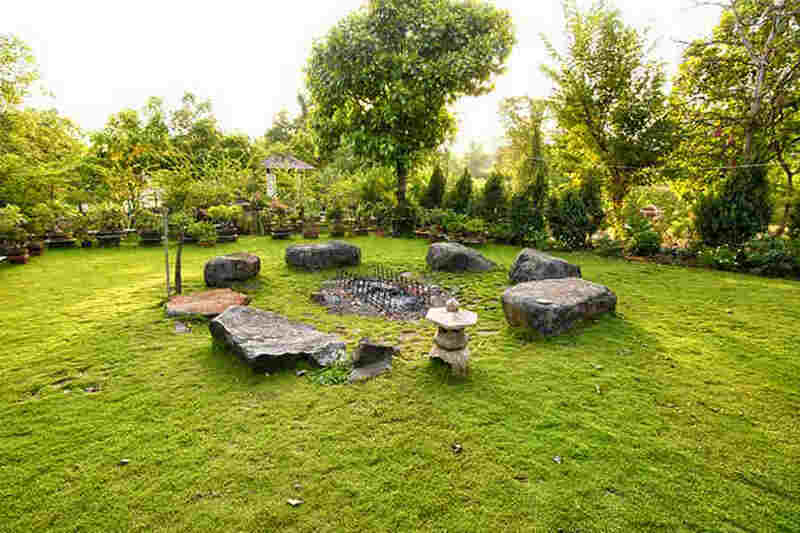 A green habitat with a rustic ambiance and an abundance of serenity – that’s the Farmhouse Homestay at Hatnoli for you. Open skies, sprawling green fields, majestic mountains, and natural vistas abound in Karjat, home to the Farmhouse Homestay at Hatnoli. Scenic and serene, the quaint Maharashtrian village rests on the foothills of the mountains of the Western Ghats. The picturesque village is also the place where the Ulhas River originates and meanders its way westwards. Karjat is a popular weekend getaway for those looking for respite from the hustle and bustle of city life. The trails speckled all around the village and the valleys attract trekkers and adventure lovers alike. While the monsoons bring out the beauty of the region, it’s a great place for a holiday any time of the year. The tranquility of the region will make you want to stay back forever. Spread over 20 acres of verdant landscape, the Farmhouse Homestay at Hatnoli is a paradise in disguise. It has everything for a holiday that you will remember for a lifetime. Lush green farmlands, a nursery, a lake and breathtaking views of the mountain ranges are only some of the incentives that drive visitors to the property all year round. The thoughtful architecture and careful landscaping ensure that you get captivating views from everywhere in the boutique farmstay. There is a nursery attached to the property with orchids, an artifact shed, bonsais, and a vertical garden display. The location and facilities make the property ideal for couple getaways, team getaways, corporate outings, destination weddings, all-women trips, and much more. Accommodation is available in the main villa and the outhouse at the Farmhouse Homestay at Hatnoli. There are five rooms in all and they are named after flowering trees that grow on the property. Parijat is the biggest room in the main villa. It has two double beds and a single bed. Palash is the second room, and it’s also located in the main villa. Amalatas and Ashmantak are two rooms that are located in the outhouse area. Basant Rani is the latest room of the outhouse area. All the rooms are air-conditioned and have an attached bathroom. The rooms are well-furnished and equipped with modern comforts to make you feel at home. Whether you want to lay back and feel pampered by nature or break a sweat doing outdoor activities, this farmhouse is the right place to be. The tariff is for Mon-Fri and Sunday. Beyond 1:00 pm will be chargeable @ Rs. 2,000/ hour up to 5:00 pm maximum. (Beyond which half day charges will be levied). Maids and Drivers will be charged extra @ Rs. 1,000/- per day with stay and meals. Pets are allowed only with prior permission. Charges @ Rs. 1000/- per pet. However, admission of pets will always be at sole discretion and permission of the Property Owner. Such permission must be obtained at the time of booking. No date changed or refunds will be entertained for any cancellations with 7 days of the scheduled check-in date. The Western Ghats are a trekker’s paradise, a nature lover’s haven, and a birdwatcher’s delight. The valleys, ranges and natural vistas make it a great getaway. Explore the region one of the many trekking trails, including the Matheran trek, the Chanderi Fort trek or the Peth Fort trek. You can also go to the Kondana Fort for a trek or a day trip. The Bhivpuri Waterfalls provide great opportunities for water sports, such as water rappelling. You can do river rafting in the Ulhas River. If you love boating and want to enjoy a leisurely picnic, head to Morbe Dam. Feel like visiting some places of historical importance? You can plan a visit to the rock-cut cave temples in Kondana, which are breathtaking natural wonders. There are age-old sculptures and stupas in the caves that add to their mystical charm. Even if you don’t step out for a minute, the farm house will provide you the best holiday ever. Enjoy your laid-back moments by the pool or head to the nursery just to see the wonders it holds. The bicycle tracks, football fields, and the activity area will your muscles busy if you wish to engage in a little activity. Chhatrapati Shivaji International Airport in Mumbai is the nearest airport from the property. It is well-connected to major cities around the world and is located 60 km away from the homestay. Pune Airport is located 104 km away from the homestay. At 7.6 km, the Karjat Railway Station is the closest station from the homestay. It’s linked to almost all the major cities in India via the Mumbai railhead. Mumbai Central Railway Station is located 66 km away. The smooth Sion-Panvel Expressway connects Karjat to Mumbai. You can also drive down from Pune (100 km), Nashik (182 km), Surat (326 km) and other major cities if you love the thrill of a road trip.